The Islamic State terror group claims it will be executing 180 Assyrian Christians who were kidnapped in mass raids in February, after negotiators failed to meet the jihadists’ high asking price to free the hostages. ARA News reported on Monday that the terror group is asking for $12 million for the release of the Assyrians, a sum deemed “unbearable” for the community. “The negotiations, led by Bishop Ephrem Otnaial, head of the Church of the East in Syria, have been suspended due to the unbearable demands of the terror group,” revealed Osama Edward, director of the Assyrian Human Rights Network. “ISIS threatened to execute the 180 hostages if we didn’t pay the ransom,” he continued. A member of the Civil Peace Committee in Tel Temir, who chose to remain anonymous, said that “internal rifts” emerged among Assyrian officials about how to gather the money. The 180 Assyrians are part of a group of 230 people kidnapped by IS in February from villages in the Khabur river valley in Syria. Early in September, hopes emerged that the hostages might be freed, after IS reportedly agreed to lower its ransom demands. Syrian Catholic Archbishop Jacques Behnan Hindo revealed that negotiators had managed to explain to IS forces that asking for 23 million dollars to free 230 people was an impossible sum, and claimed that IS had decided to ask for “much, much less,” though he did not share the precise amount. “Therefore, now, the biggest obstacle regarding the release of our Assyrian brothers is no longer money, but the difficulty of how to organize the phase of liberation,” Hindo said at the time. The Catholic Archbishop even suggested that buses were being organized to collect the hostages and bring them back to Hassaké. The terror group, which has been persecuting Christians and other religions minorities across Iraq and Syria, has released small groups of hostages it kidnapped from Khabur, but is still holding the vast majority of people it took captive. 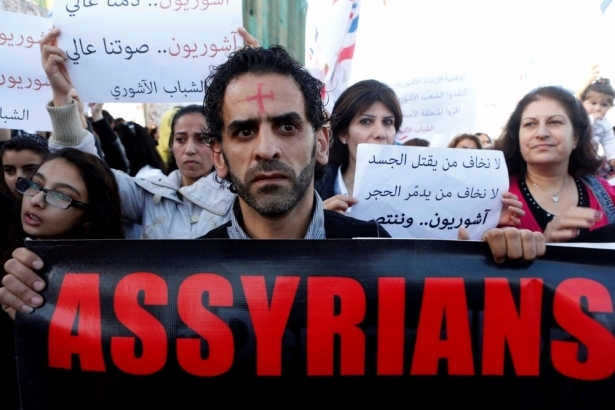 IS has specifically targeted Assyrians, looking to drive them out of their millennia-old communities. Last week, IS released a video showing the executions of three of the hostages, which drew condemnation from persecution watchdog groups, such as A Demand for Action. “We condemn this latest act of barbarism in the strongest possible terms. The systematic ethno-religious cleansing of Assyrians/Syriacs/Chaldeans continues. They are helpless. They are children. They are women. They are somebody’s father and brother,” wrote A Demand for Action spokesperson Diana Yaqco.